Dentistry is a branch of medicine that specializes in the diagnosis and treatment of diseases of the teeth and gums, as well as diseases of the oral cavity and maxillofacial area. The earliest history of dentistry may be traced back to nearly 7000 BCE in the Indus Valley Civilization, in what is now Pakistan. Archeological finds from the area indicate that bead craftsmen used a drill made of flint heads to remove tooth enamel and rotting dental tissue and examination of recovered teeth and jawbones from the same time period suggest that this procedure was surprisingly effective. The first professional dentists in Europe were known as “barber-surgeons” and guilds of these barber-surgeons were Europe from around the thirteenth century. They were generally responsible for a range of gruesome medical treatments, such as bleeding, cupping, leeching, giving enemas and extracting teeth. It wasn’t until the early eighteenth century that dentistry emerged as an exclusive profession. A Frenchman named Pierre Fauchard (1678-1761) is known today as the “Father of Modern Dentistry.” At15 years old, Fauchard began his surgical training in the French navy. He became particularly interested in diseases of the mouth as he was exposed to various illnesses of sailors while at sea. Prominent on his voyages was scurvy which occurs due to a deficiency of vitamin C and is characterized by the formation of spots on the skin, spongy gums, bleeding from the mucous membranes, and the eventual loss of teeth and sections of the jawbone. “Le Chirurgien Dentiste Ou Traité Des Dents” (The Surgeon-Dentist, or Treatise on the Teeth), in 1728. Throughout the early 1800s, dental technology quickly advanced. A series of scientists made important breakthroughs in dental care, particularly in denture development. Italian physician, Giuseppangelo Fonzi developed porcelain teeth with baked-in retentive pins and Charles Stent of England invented the impression compound, an important development for the future of dental prosthetics. Three Americans also made discoveries that advanced dentistry. Robert Arthur introduced cohesive gold foil used for soldering procedures and denture bases, Horace Wells invented nitrous oxide anesthesia, and finally, Charles Goodyear invented the vulcanization process of rubber, which utterly revolutionized the materials used in dentistry. Dentistry gained its first real foothold in Canada and America in the mid-eighteenth century as some European dentists arrived in the new colony and settlers quickly took up apprentice positions. Dental education in North America underwent many changes by the mid-1800s. The Baltimore College of Dental Surgery, founded in 1840, became the world’s first school of dentistry. In 1867, the Harvard University Dental School was the first school to issue the Doctor of Dental Medicine Degree. By 1870, there were a total of nine dental schools in the United States. Following this example, the next step for dentistry in Canada was the development of its own system of specialized education. In 1868, the RCDSO Act allowed the Board of Ontario Dentists to establish a Dental College in Toronto. By 1888, the College affiliated with the University of Toronto. It conferred twenty-five Doctor of Dental Surgery Degrees (D.D.S.) to graduates in 1889. 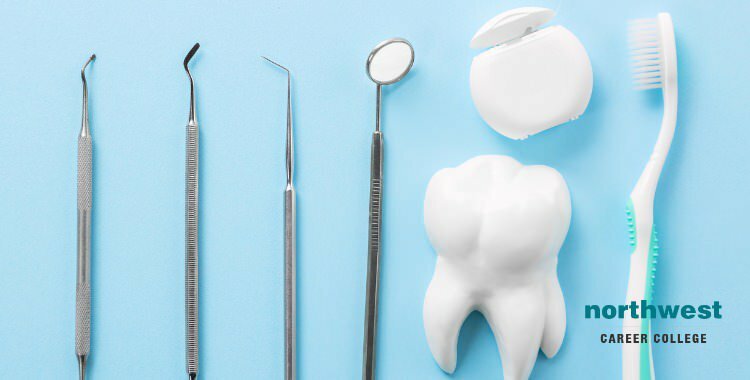 Dentistry continued to expand rapidly throughout the 20th century and has evolved into an increasing number of graduate programs that specialize in various fields, including oral radiology, maxillofacial surgery, oral pathology, pediatric dentistry, and prosthodontics. Here at Northwest Career College, our Dental Administrative Assisting Program prepares students to work in any dental office. Our expansive, nine operatory lab provides students with real-life dental office experience. You will be trained to handle clerical duties such as scheduling appointments, handling insurance claims, and monitoring inventory. You will work with documents, forms, and computer systems. No other Dental Administrative Assistant Program in Las Vegas offers this type of advanced training.